The IRS needs to be investigated!!! If the agency didn’t know what it was doing, it wouldn’t have done it so well. Quickly: Everyone agrees the Internal Revenue Service is, under current governmental structures, the proper agency to determine the legitimacy of applications for tax-exempt status. Everyone agrees the IRS has the duty to scrutinize each request, making sure that the organization meets relevant criteria. Everyone agrees groups requesting tax-exempt status must back up their requests with truthful answers and honest information. Some ask, “Don’t conservatives know they have to be questioned like anyone else?” Yes, they do. Their grievance centers on the fact they have not been. They were targeted, and their rights violated. In March 2012, the organization, which argues the case for traditional marriage, found out its confidential tax information had been obtained by the Human Rights Campaign, one of its primary opponents in the marriage debate. The HRC put the leaked information on its website—including the names of NOM donors. The NOM not only has the legal right to keep its donors’ names private, it has to, because when contributors’ names have been revealed in the past they have been harassed, boycotted and threatened. This is a free speech right, one the Supreme Court upheld in 1958 after the state of Alabama tried to compel the NAACP to surrender its membership list. In April 2012, the NOM asked the IRS for an investigation. The inspector general’s office gave them a complaint number. Soon they were in touch. Even though the leaked document bore internal IRS markings, the inspector general decided that maybe the document came from within the NOM. The NOM demonstrated that was not true. 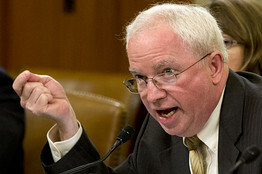 John Eastman, National Organization for Marriage chairman, testifying before Congress about the IRS’s political targeting of his group, June 4. For the next 14 months they heard nothing about an investigation. By August 2012, the NOM was filing Freedom of Information Act requests trying to find out if there was one. The IRS stonewalled. Their “latest nonresponse response,” said Mr. Eastman, claimed that the law prohibiting the disclosure of confidential tax returns also prevents disclosure of information about who disclosed them. Mr. Eastman called this “Orwellian.” He said that what the NOM experienced “suggests that problems at the IRS are potentially far more serious” than the targeting of conservative organizations for scrutiny. In hearings Thursday, Rep. Elijah Cummings, a Maryland Democrat who disagrees with the basic stand of the NOM, said that what had happened to the organization was nonetheless particularly offensive to him. The new IRS director agreed he would look into it. Some sophisticated Democrats who’ve worked in executive agencies have suggested to me that the story is simpler than it seems—that the targeting wasn’t a political operation, an expression of political preference enforced by an increasingly partisan agency, its union and assorted higher-ups. A former senior White House official, and a very bright man, said this week he didn’t believe it was mischief but incompetence. But why did all the incompetent workers misunderstand their jobs and their mission in exactly the same way? Wouldn’t general incompetence suggest both liberal and conservative groups would be abused more or less equally, or in proportion to the number of their applications? Wouldn’t a lot of left-wing groups have been caught in the incompetence net? Wouldn’t we now be hearing honest and aggrieved statements from indignant progressives who expected better from their government? “The IRS didn’t respond to a request for comment,” they wrote. There really is an air about the IRS that they think they are The Untouchables. Some have said the IRS didn’t have enough money to do its job well. But a lack of money isn’t what makes you target political groups—a directive is what makes you do that. In any case, this week’s bombshell makes it clear the IRS, from 2010 to 2012, the years of prime targeting, did have money to improve its processes. During those years they spent $49 million on themselves—on conferences and gatherings, on $1,500 hotel rooms and self-esteem presentations. “Maliciously self-indulgent,” said Chairman Darrell Issa at Thursday’s House Oversight and Government Reform Committee hearings. What a culture of entitlement, and what confusion it reveals about what motivates people. You want to increase the morale, cohesion and self-respect of IRS workers? Allow them to work in an agency that is famous for integrity, fairness and professionalism. That gives people spirit and guts, not “Star Trek” parody videos. A version of this article appeared June 8, 2013, on page A15 in the U.S. edition of The Wall Street Journal, with the headline: The IRS Can’t Plead Incompetence.